Mounting Type: Single Foot, Foot Size: 1" or 2"
Note: Balmar's 1/2" Deep Vee Pulleys (Single and Dual) can accept a 3/8" and 7/16" belt. Click Here to view Balmar Catalog. 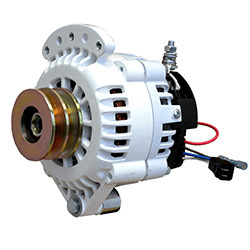 Click Here for Alternator Installation Instructions & Operation Manual.